Peterhead defender Jamie Stevenson felt referee Sam Purkiss did the Blue Toon no favours in their 1-0 IRN-BRU Cup defeat to League of Ireland side Bohemians. A number of early rash challenges were let go by the English official with Stevenson in particular on the receiving end of a number of hefty lunges. Purkiss has refereed National League and the Premier League’s under-23s division this season and was called upon due to Peterhead playing a team from outwith Scotland. Bohs manager Keith Long also felt the official let a lot of challenges go and Stevenson was of the view that the Blue Toon were hard done by with some decisions. Kevin Devaney scored the only goal of the game to ensure Bohemians progressed at the expense of Peterhead, extending their winning run to six games. 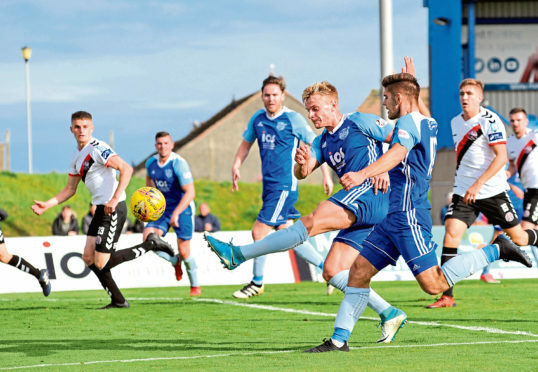 The visitors were every bit as physical as Peterhead manager Jim McInally expected, with makeshift full-back Stevenson in particular singled out for some aggressive treatment. But neither side offered much in the way of a goal threat, with the Blue Toon failing to force Colin McCabe into a meaningful save in the first half and Greg Fleming only called into action to claw away a speculative attempt from Eoghan Stokes. Willie Gibson nipped in between two defenders to have Peterhead’s first chance of the second half but shot straight at McCabe, while Stokes failed to get a toe to a back-post cross by Ryan Graydon at the other end. Devaney gave Bohs the lead on 63 minutes as he took the ball in his stride just outside the box and struck with the outside of his right foot into the bottom corner. It could have been two six minutes later when Daniel Byrne played Robbie McCourt in behind but, despite rounding Fleming, he was forced wide and could not find the target. Peterhead’s best opportunities came from set-pieces with Rory McAllister and Aaron Norris having goal-bound efforts blocked. They surged forward in desperation for a leveller in stoppage time and Jason Brown smacked the crossbar as the Blue Toon’s chances evaporated. Stevenson added: “I don’t think 1-0 was a fair reflection of the game but the performance was a lot better.